Summer cocktails with beach ambience, On a modern terrace lovingly arranged three wooden constructions of different size. Summer cocktails with beach ambience. On a modern terrace lovingly arranged three wooden constructions of different size, but connected with each other, line up along one axis: the entrance to the café-restaurant flooded with light through all-around glazing down to the floor, a bar area, and the kitchen with toilets for customers and tourists. 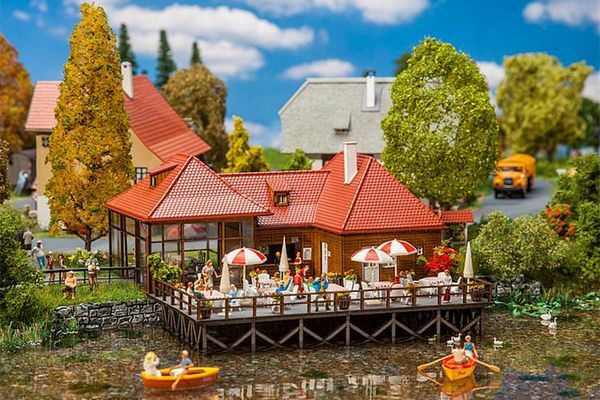 The loveliest place is the large sunny terrace built on piles directly over shallow water, where it is possible to perfectly enjoy the relaxing atmosphere on a lake. Tables, chairs, sunshades, and a roofed advertising sign are included.